If you look at a description of an archival holding in the Portal, you will probably find that most information elements are more or less self-explanatory, especially if you are already familiar with archival information systems. Rather than systematically explaining the meaning and function of all elements of an archival description, we will focus here on a few that are particularly important in the context of the Portal. Have a look at the screenshot below. 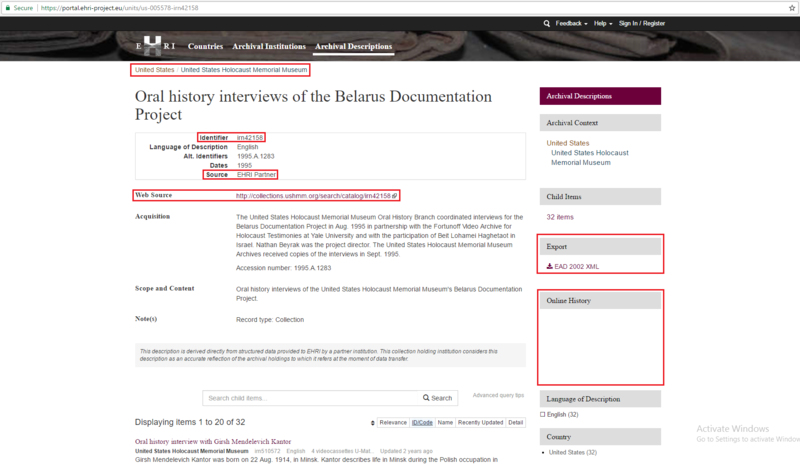 It shows you the descriptions of the collection "Oral history interviews of the Belarus Documentation Project". As discussed in Chapter 2 above, Poral information is arranged hierarchically. You can see how the item you are viewing fits into the hierarchies in the “Archival Context” and “Child Item” boxes. In the case of the "Oral history interviews of the Belarus Documentation Project", you can see that it has two superior (or parent) levels: “The United States Holocaust Memorial Museum” (USHMM) - i.e. the archival institution that holds the collection - and the United States - the country in which the USHMM is located. The information provided in the Child Items box indicates that the this collection encompasses 32 child items - i.e. items at a lower level in the hierarchy (in this case the individual interviews that make up the Belarus Documentation Project. All the information in the "Archival context", "Child Items" and breadcrumb are clickable, thus allowing you navigate up and down the hierarchy. As explained in Chapter 3 above, most descriptions of archival holdings available in the Portal have not been written by EHRI, but are based on exports from the digital catalogues of the holding institutions. The field "Source" indicates who has authored a given description. In our example this field has the value "EHRI Partner" which means that this description is based on an export from an EHRI Partner institution; for descriptions that were directly authored by EHRI, this field would have the value "EHRI" instead. For some of the descriptions authored by the holding institution, the field "web source" provides you with a link to the same description in the relevant institution's online catalogue. Following such links can be very useful, as the catalogue of the holding institution may hold additional information that is not reproduced in the EHRI Portal, or may provide you with access to a digital copy of the described holding. In our example, for instance, following the websource link (http://collections.ushmm.org/search/catalog/irn42158) will give you direct access to video recording of these interviews hosted by USHMM. You can download all description of archival sources as Encoded Archival Descriptions (EAD) XML files by following the Export links provided in the right-hand side of the screen. The Online History box on the right-hand side of the screen provides you with information when the item you are viewing was last updated on the EHRI portal.